Background—The pathogenesis of pancreatic fibrosis is unknown. In the liver, stellate cells (vitamin A storing cells) play a significant role in the development of fibrosis. Aims—To determine whether cells resembling hepatic stellate cells are present in rat pancreas, and if so, to compare their number with the number of stellate cells in the liver, and isolate and culture these cells from rat pancreas. Methods—Liver and pancreatic sections from chow fed rats were immunostained for desmin, glial fibrillary acidic protein (GFAP), and α smooth muscle actin (α-SMA). Pancreatic stellate shaped cells were isolated using a Nycodenz gradient, cultured on plastic, and examined by phase contrast and fluorescence microscopy, and by immunostaining for desmin, GFAP, and α-SMA. Results—In both liver and pancreatic sections, stellate shaped cells were observed; these were positive for desmin and GFAP and negative for α-SMA. Pancreatic stellate shaped cells had a periacinar distribution. They comprised 3.99% of all pancreatic cells; hepatic stellate cells comprised 7.94% of all hepatic cells. The stellate shaped cells from rat pancreas grew readily in culture. Cells cultured for 24 hours had an angular appearance, contained lipid droplets manifesting positive vitamin A autofluorescence, and stained positively for desmin but negatively for α-SMA. At 48 hours, cells were positive for α-SMA. Conclusions—Cells resembling hepatic stellate cells are present in rat pancreas in a number comparable with that of stellate cells in the liver. These stellate shaped pancreatic cells can be isolated and cultured in vitro. Pancreatic fibrosis is a central pathological feature of chronic pancreatitis.1 However, the mechanisms responsible for the development of fibrosis in chronic pancreatitis remain unknown. Research regarding pancreatic fibrogenesis has been hampered by the lack of suitable in vivo and in vitro models. In contrast, in the liver, the pathogenesis of fibrosis has been well studied.2 There is increasing evidence to suggest that stellate cells (also known as vitamin A storing cells) play an important role in the production of hepatic fibrosis3; indeed they have been shown to be the major effector cells in the fibrogenic process.4 Hepatic stellate cells are resident liver cells located in the perisinusoidal space of Disse, between hepatocytes and the sinusoidal lining.3 These cells have long cytoplasmic processes giving them a typical “stellate” appearance. In the quiescent (non-activated) phase, hepatic stellate cells have been shown to have numerous vitamin A containing lipid droplets in the cytoplasm5 and to exhibit positive immunostaining for two cytoskeletal marker proteins, desmin6 and glial fibrillary acidic protein (GFAP).7 When activated by profibrogenic mediators such as inflammatory cytokines8 and oxidant stress,9stellate cells transform into myofibroblast-like cells characterised by: (a) positive immunostaining for the cytoskeletal protein α smooth muscle actin (α-SMA) in addition to desmin and GFAP10; (b) reduction in vitamin A lipid droplets11 12; (c) hypertrophy of rough endoplasmic reticulum13; and (d) greatly increased synthesis of extracellular matrix proteins (known to accumulate in fibrotic livers) including collagens, proteoglycans, structural glycoproteins, and hyaluronan.8 Activated hepatic stellate cells are therefore thought to be responsible for the initiation of fibrosis in the liver. It is possible that the development of pancreatic fibrosis also occurs through a similar mechanism—that is, via pancreatic stellate cells. Vitamin A storing cells were first described in the pancreas of vitamin A loaded mice, by Watari et al in 1982, using fluorescence and electron microscopy.14Stellate cells were identified by the characteristic rapidly fading blue-green fluorescence emitted by vitamin A in the cell cytoplasm when exposed to ultraviolet light at 328 nm. Subsequently, Ikejiri showed positive, but sparsely distributed vitamin A autofluorescence in normal pancreatic sections from rats and humans.15 The density of stellate cells in rat pancreas was reported to be a tenth of that in the liver. In pancreatic specimens taken from patients with chronic alcoholic pancreatitis, stellate cells were observed in fibrotic areas in close association with collagen fibres.15 Both the above mentioned studies relied on the fluorescence of vitamin A to identify stellate cells. However, this technique may not adequately identify all stellate cells in a given tissue as studies in the liver have shown that the vitamin A content of stellate cells can vary considerably.16 17 Other than the two studies noted above, there has been no attempt to characterise stellate cells in the pancreas. Therefore, the aims of the study were: (a) to identify and characterise stellate cells in rat pancreas; (b) to compare the relative abundance of stellate cells in the pancreas and the liver; and (c) to isolate and culture rat pancreatic stellate cells. Pancreatic and liver tissue from chow fed male Sprague-Dawley rats (n=4) was snap frozen in isopentane precooled in liquid nitrogen. Sections (6 μm) were cut using a cryotome and processed for immunohistochemical staining as described below. Cryostat sections of liver and pancreas were immunostained for desmin using published techniques.18 In addition, pancreatic sections were stained for two other cytoskeletal proteins, GFAP and α-SMA. Sections were fixed in acetone at 4°C for 10 minutes, air dried, washed for five minutes with three changes of 1× Tris buffered saline (TBS) at room temperature, and incubated with 1% H2O2-methanol for 30 minutes to block endogenous peroxidase activity. After further washes, sections were incubated for 30 minutes with TBS containing 10% goat serum and 1% bovine serum albumin (BSA) to prevent non-specific binding of antibody. Sections were then incubated with the primary antibody (monoclonal mouse antidesmin antibody 1/100; or polyclonal rabbit anti-GFAP antibody 1/300; or monoclonal mouse anti-α-SMA antibody 1/200) in TBS containing 10% goat serum and 1% BSA for 30 minutes at room temperature. After three washes in TBS for five minutes each, sections were incubated for 30 minutes at room temperature with the appropriate peroxidase conjugated secondary antibody (peroxidase conjugated goat antimouse IgG diluted 1/100 or peroxidase conjugated goat antirabbit IgG diluted 1/100) in TBS containing 10% goat serum and 1% BSA. The colour was developed using the Dako liquid DAB substrate-chromogen system and sections were then counterstained with Mayer’s haematoxylin for five minutes. Negative control preparations included sections incubated without primary antibody and sections incubated with an irrelevant antibody of the same immunoglobulin subclass (Ber-EP4, Dako; and MOP-C21, Sigma) and were consistently found to show no reaction. Staining of blood vessel walls served as a positive control for both desmin and α-SMA stains. Desmin stained liver and pancreatic sections were photographed and three predominantly parenchymal fields were selected randomly by an observer not connected with the project. The total number of nuclei in each field was determined and the number of nuclei associated with desmin positive (brown) staining in the cytoplasm was expressed as a percentage of total nuclei counted per section (total number of nuclei counted per section was at least 500). Cells associated with vascular structures (in both liver and pancreatic sections) were excluded from the total cell counts. Pancreatic stellate shaped cells were isolated by a modification of the method described by Schafer et al in the liver.19 Briefly, pancreatic tissue from two rats weighing approximately 300 g each was pooled, minced with scissors, and digested with 0.02% pronase, 0.05% collagenase P, and 0.1% DNAse in Gey’s balanced salt solution (GBSS). Digested tissue was pipetted through successively narrow orifices and then filtered through a 150 μm nylon mesh. Cells were washed and resuspended in 9.5 ml GBSS containing 0.3% BSA. The cell suspension was mixed with 8 ml of 28.7% (wt/vol) of Nycodenz in Gey’s solution without salt. The Nycodenz gradient was prepared by layering the cell suspension in Nycodenz underneath 6 ml Gey’s solution with BSA in a 40 ml centrifuge tube. The gradient was centrifuged for 20 minutes at 1400g. The cells of interest separated into a fuzzy band just above the interface of the Nycodenz cushion and the GBSS with BSA. This band was harvested, and the cells washed and resuspended in Iscove’s modified Dulbecco’s medium containing 10% fetal calf serum, 4 mM glutamine, and antibiotics (penicillin 100 units/ml; streptomycin 100 μg/ml). Viability of isolated cells was assessed by trypan blue exclusion and cells were counted using a haemocytometer. An aliquot of freshly isolated cells was cytospun directly onto a poly-l-lysine coated slide for immunostaining and fluorescence microscopy. The remaining cell preparation was seeded in a density of 50 000 cells per well in plastic six well culture plates in Dulbecco’s medium with fetal calf serum, glutamine, and antibiotics as detailed above. Cells were maintained at 37°C in a humidified atmosphere of 5% CO2/95% air. The culture medium was changed daily and cells were examined after 24, 48, 72, and 96 hours in culture by phase contrast microscopy, fluorescence microscopy, and immunochemical staining for desmin, GFAP, and α-SMA. Pancreatic stellate shaped cells in primary culture were removed by trypsinisation for five minutes, at confluency. The cell suspension was diluted 1/2 in culture medium and cells were replated. After replating most cells reattached within 30 minutes; respreading occurred after about three hours. Thereafter cell division recurred and the cultures reached confluency in four days. Freshly isolated cells and cells in culture were examined by fluorescence microscopy (using a Zeiss fluorescence microscope, Carl Zeiss Pty Ltd, Sydney, Australia) for autofluorescence of vitamin A. At an excitation wavelength of 328 nm hepatic stellate cells have been shown to emit a characteristic rapidly fading blue-green fluorescence due to their vitamin A stores.19 Epidermal cells and cultured fibroblasts (NIH-3T3) were used as negative controls. Freshly isolated and cultured cells were immunostained for desmin, GFAP, and α-SMA essentially as described above for tissue sections. All chemicals were of analytical reagent grade and were purchased from Sigma Chemical Company (St Louis, Missouri). Collagenase P was purchased from Boehringer Mannheim (Mannheim, Germany), protease (type XIV from Streptomyces griseus) was obtained from Sigma Chemical Company (St Louis, Missouri), and DNAse was purchased from Pharmacia Biotech (Uppsala, Sweden). Cell culture reagents were purchased from Sigma Chemical Company (St Louis, Missouri). Nycodenz was obtained from Nycomed Pharma AS (Oslo, Norway). Iscove’s modified Dulbecco’s medium was purchased from Gibco BRL. Monoclonal antibodies to desmin and α-SMA were obtained from Sigma Chemical Company (St Louis, Missouri) and the polyclonal antibody to GFAP was bought from Dako (Carpinteria, California). Pancreatic and liver sections from chow fed rats showed positive staining for desmin localised to discrete stellate shaped cells and their cytoplasmic processes (fig 1 panels 1 and 2). Pancreatic sections were also positive for GFAP in a distribution similar to that seen with the desmin stain (fig 1 panel 3). However, pancreatic sections stained with α-SMA showed no positively staining cells in the parenchyma although densely stained areas were observed in smooth muscle components of blood vessels and ducts (fig 1 panel 4). The above results (positive staining for desmin and GFAP and negative staining for α-SMA) suggest that the normal rat pancreas contains cells which exhibit features similar to those described for quiescent (non-activated) hepatic stellate cells. The stellate shaped cells in the pancreas were located in the interacinar spaces, with elongated cytoplasmic processes encircling the base of adjacent acinar cells (fig 1 panel 1) in a manner analogous to that shown in the liver. Such cells were not observed in association with pancreatic islets. Panel 1: Immunostaining for desmin in pancreatic tissue sections (×40 objective). On the left is a photomicrograph of a section of the pancreas with a corresponding line diagram on the right. Desmin positive stellate shaped cells (PSC) were observed in the interstitium between acini (A). The cells had elongated cytoplasmic processes extending around the basal aspect of adjacent acinar cells. Panel 2: Immunostaining for desmin in liver tissue sections (×40 objective). On the left is a photomicrograph of a section of the liver with a corresponding line diagram on the right. Stellate cells (HSC) were stained brown and were located in the perisinusoidal space between hepatocytes (H) and hepatic sinusoids (S). Panel 3: Immunostaining for GFAP in pancreatic tissue sections (×25 objective). The positively stained (brown) stellate cells are seen in the same distribution as observed with the stain for desmin. Panel 4: Immunostaining for α-SMA in pancreatic tissue sections (×16 objective). No positively staining cells were found in the parenchyma of normal pancreas. Dense staining was observed in smooth muscle components of pancreatic ducts and blood vessels. Panel 5: Immunostaining for desmin in a cytospin of freshly isolated cells (×40 objective). Positive staining (brown) for desmin was observed in the cytoplasm. Panel 6: Phase contrast microscopy of cells after 24 hours in culture (×20 objective). Cells had assumed a flattened, angular appearance and showed abundant lipid droplets in the cytoplasm. Using desmin as the marker, it was observed that stellate cells in the liver constituted 7.94 (0.79)% of total liver cells, while stellate shaped cells in the pancreas constituted 3.99 (0.42)% of all pancreatic cells. Yield and viability—The yield of stellate shaped cells was 200 000 (1400) cells per g pancreas (n=4 isolations). Viability of isolated cells as assessed by trypan blue exclusion was more than 80% in each experiment. Freshly isolated cells had a globular, fatty appearance similar to that described for hepatic stellate cells. Purity of the preparation as assessed by vitamin A autofluorescence was 75%. Immunocytochemistry—Freshly isolated cells were positive for desmin (fig 1 panel 5) but negative for α-SMA. Phase contrast microscopy—At 24 hours in culture at least 90% of cells had attached to the wells and had assumed a stellate, angular appearance with prominent lipid droplets in the cytoplasm (fig 1 panel 6). Purity of the preparation was more than 90% as assessed by vitamin A autofluorescence (fig 2panel 7). At a seeding density of 200 000 cells per well, the doubling time of cells in primary culture (as assessed by cell counting) was 96 hours. As the cells had reached confluency at 96 hours they were harvested by trypsinisation, diluted in culture medium, and reseeded (first passage). Panel 7: Vitamin A autofluorescence of cells after 24 hours in culture (×20 objective). Cells examined under ultraviolet illumination at 328 nm revealed blue-green fluorescence indicating the presence of vitamin A in the cytoplasm. Panel 8: Immunostaining for desmin (a) and GFAP (b) of pancreatic stellate shaped cells after 24 hours in culture (×40 and ×25 objective respectively). Cells were positive for both cytoskeletal markers. The high power view of the desmin positive cell clearly reveals a typical fibrillar staining pattern in the cell cytoplasm. Panel 9: Immunostaining for α-SMA of pancreatic stellate shaped cells after 48 hours in culture (×25 objective). Positive staining of cells was observed in a fibrillar pattern in the cytoplasm. Immunocytochemistry—At 24 hours in culture, cells were positive for desmin and GFAP (fig 2 panel 8) but negative for α-SMA. Cultured cells became positive for α-SMA after 48 hours in culture (fig 2 panel 9). Positive staining for each of the cytoskeletal proteins was observed in a typical fibrillar pattern in the cell cytoplasm. Using immunohistochemical methods, this study has provided evidence that the rat pancreas contains cells which exhibit features similar to those described for hepatic stellate cells. The number of these stellate shaped cells in rat pancreas was comparable to that of stellate cells in the liver. Furthermore, this study has shown, for the first time, that these cells can be isolated from the pancreas and cultured in vitro. Presence of numerous prominent lipid droplets in the cytoplasm11; these lipid droplets contain vitamin A as indicated by the characteristic fluorescence observed in cells exposed to ultraviolet light.5 The positive vitamin A autofluorescence observed also indicates that these cells are unlikely to be fibroblasts or smooth muscle cells. The pancreatic stellate shaped cells proliferated rapidly in culture with a doubling time of 96 hours, although this rate of proliferation is slower than that described for cultured hepatic stellate cells.19 Cultured cells exhibited a decrease in the number of lipid droplets in the cytoplasm after 48 hours in culture, possibly due to cell division or activation. This phenomenon has been described in cultured hepatic stellate cells11and is consistent with an activated state of the cells as confirmed by positive immunostaining for α smooth muscle actin. The cells could be passaged through at least two cycles and could be kept in culture for at least 15 days. Passaged cells exhibited a significantly higher rate of proliferation than cells in primary culture with the number of cells increasing 10-fold after 120 hours of the first passage. As noted earlier, the role of stellate cells in the development of hepatic fibrosis has been well defined.2 Activation of hepatic stellate cells by factors such as the inflammatory cytokines, transforming growth factor β and tumour necrosis factor α, and by oxidant stress leads to increased rates of proliferation, transformation into myofibroblast-like cells, and increased secretion of extracellular matrix proteins, in particular collagen. The identification of periacinar stellate shaped cells in the pancreas and the ability to isolate and culture them as described in this study, represents an important advance with respect to studies on the putative role of these cells in the production of pancreatic fibrosis. Indeed, a recent report showing increased α smooth muscle actin expression in fibrotic areas of pancreatic tissue from patients with chronic pancreatitis provides some support for the possibility that activated pancreatic stellate cells may be one of the cell types that play a role in pancreatic fibrogenesis.22 Cultured cells will now enable investigations to be performed into the direct effects of putative profibrogenic mediators on proliferation and activation of these stellate shaped cells in the pancreas. It is of interest to note that alcohol (one of the major associations of chronic pancreatitis) has been shown to induce oxidant stress in the pancreas,23raising the possibility that activation of the pancreatic stellate shaped cells (described in the present study) by alcohol induced oxidant stress may be an initiating factor in the development of alcoholic pancreatic fibrosis. In conclusion therefore, the identification, in rat pancreas, of cells closely resembling hepatic stellate cells and the ability to isolate and culture these cells, provides a novel and unique in vitro model for future studies on the pathogenesis of pancreatic fibrosis. (1991) Perisinusoidal stellate cells of the liver: important roles in retinol metabolism and fibrosis. FASEB J 5:271–277. (1987) Stellate cells storing retinol in the liver of adult lamprey, Lampetra japonica. Cell Tissue Res 249:289–299. (1984) Immunocytochemical detection of desmin in fat-storing cells (Ito cells). Hepatology 4:709–714. 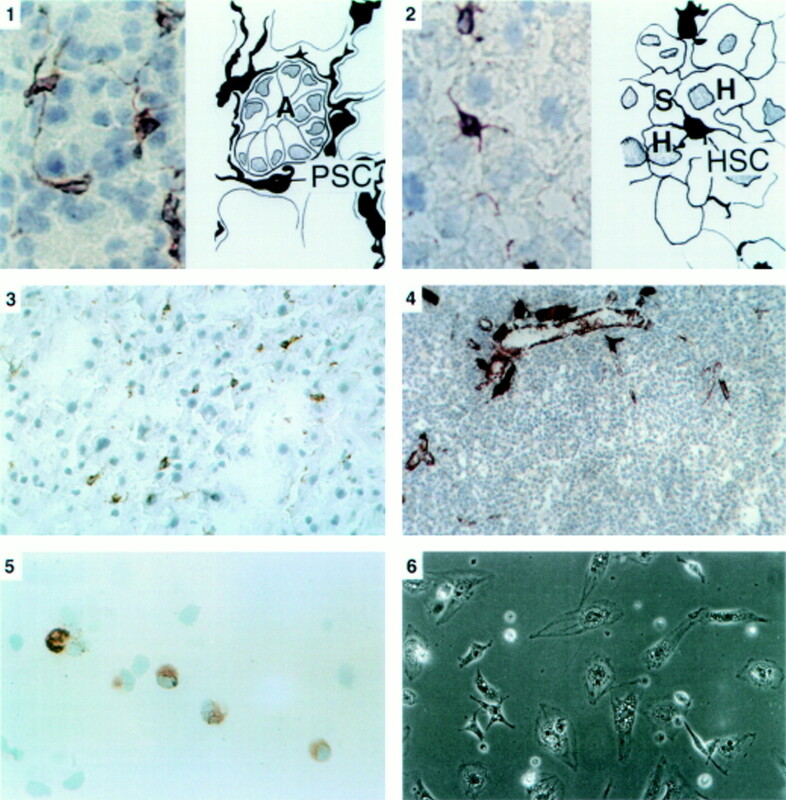 (1996) Glial fibrillary acidic protein as a marker of perisinusoidal stellate cells that can distinguish between the normal and myofibroblast-like phenotypes. Biol Cell 87:65–73. (1996) On the role of lipid peroxidation in the pathogenesis of liver damage induced by long-standing cholestasis. Free Radic Biol Med 20:351–359. (1988) Desmin and actin in the identification of Ito cells and in monitoring their evolution to myofibroblasts in experimental liver fibrosis. Virchows Arch 56:45–49. (1984) Purified rat liver fat-storing cells in culture divide and contain collagen. Hepatology 4:392–403. (1992) Rat hepatic lipocytes express smooth muscle actin upon activation in vivo and in culture. 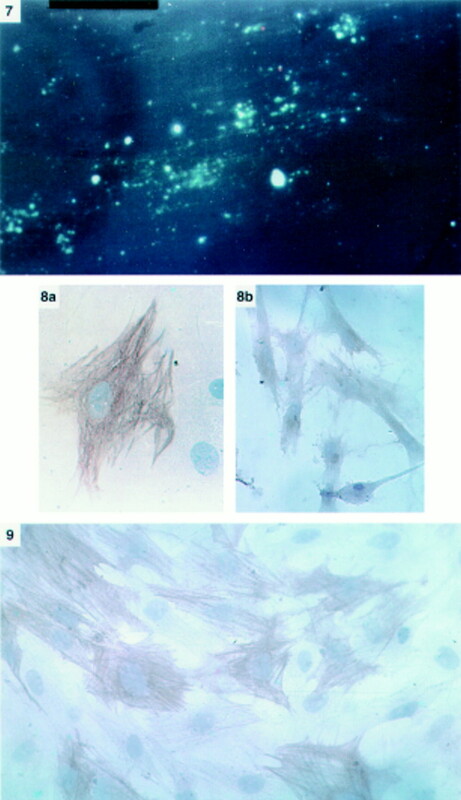 J Submicrosc Cytol Pathol 24:193–203. (1992) Identification and partial characterization of a hepatocyte-derived factor promoting proliferation of cultured fat-storing cells (parasinusoidal lipocytes). Hepatology 16:1250–1266. (1982) Morphological studies on a vitamin A-storing cell and its complex with macrophage observed in mouse pancreatic tissues following excess vitamin A administration. Okajimas Folia Anat Jpn 58:837–858. (1990) The vitamin-A storing cells in the human and rat pancreas. Kurume Med J 37:67–81. (1979) Ultrastructure of the hepatic perisinusoidal cells in man and other mammalian species. Anat Rec 194:571–586. (1995) Vitamin A-poor lipocytes: a novel desmin-negative lipocyte subpopulation, which can be activated to myofibroblasts. Am J Physiol 269:G532–G541. (1989) in Immunochemical staining methods. ed Haish SJ (Dako Corporation, California), pp 1–24. (1989) In vitro differentiation of fat-storing cells parallels marked increase of collagen synthesis and secretion. J Hepatol 9:59–68. (1991) Time-related distribution profiles of sulfated glycosaminoglycans in cells, cell surfaces, and media of cultured rat liver fat-storing cells. Proc Soc Exp Biol Med 196:307–315. (1997) Myofibro- blasts expressing α-smooth muscle actin in human chronic pancreatitis [abstract]. Gastroenterology 112:A431. (1996) Acute ethanol administration induces oxidative changes in rat pancreatic tissue. Gut 38:742–746.